I love Halloween! It is the only time of the year when it's acceptable to become someone else. The trick-or-treaters, the parties, and the decor truly make Halloween a fun and festive occasion. So much thought and preparations go into Halloween from the treats you hand out on Halloween night to your ghoulish ensemble meant to frighten your friends. If you are a fellow Halloween lover or a Poe enthusiast this wreath is for you! 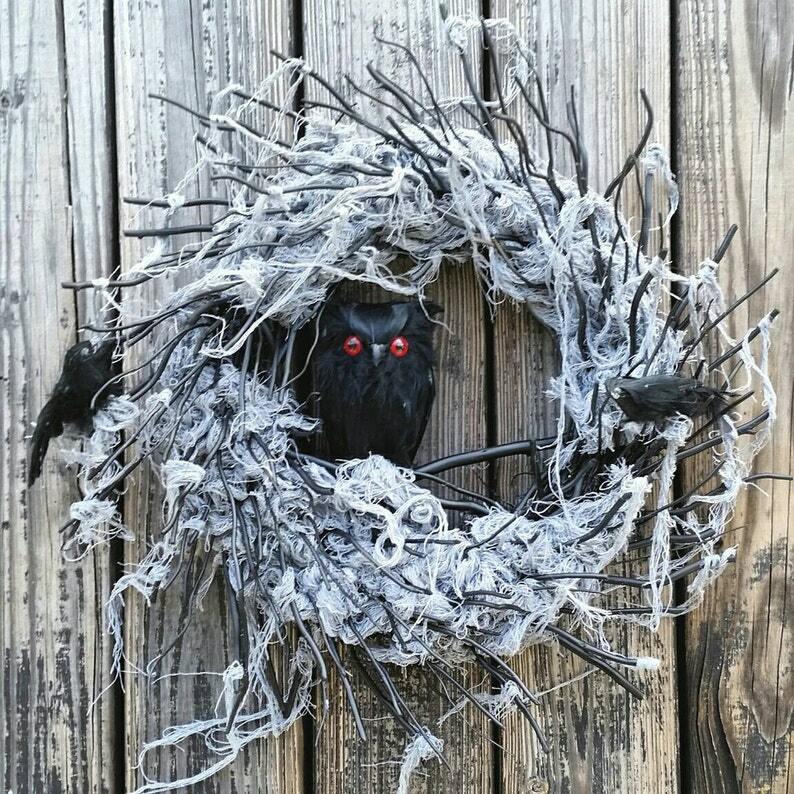 Using Poe' s "The Raven" as inspiration, I first created a black twig wreath form. To create a creepy forest feel I strung gray cheesecloth amid the twigs. By adding a black owl and two miniature ravens you suddenly feel like you are in a dark and demented forest where the nocturnal birds, and even the trees, keep a close eye on you! Measuring approximately 23 inches (tip to tip) this wreath was created on a grapevine wreath base. I was not pleased with the wreath: the owl was crooked and could not be straightened. There was no hanging hook on the back: given the price point, not a good idea for your customers. I sold it for a few dollars at a garage sale! Thank you for the review. I am so sorry you were unhappy with your purchase. I add hangers to Styrofoam and straw wreath bases, and I will definitely include that detail for grapevine bases in the future. I am also sorry your owl was crooked and will pay added attention to those details. I also have a refund policy. I would have loved to give you the opportunity to return the item for a refund if I had known. I want happy and satisfied customers, and I am truly sorry you were not happy with your Halloween Wreath. As pictured, have it hanging up already!